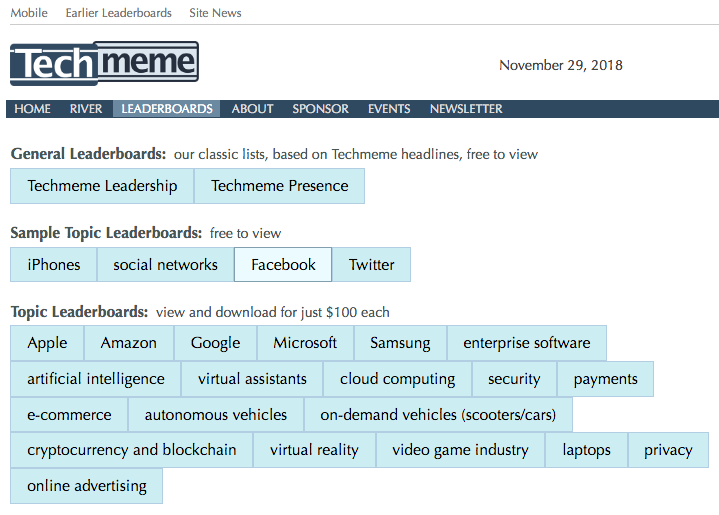 Today Techmeme has begun publishing Topic Leaderboards, which list the top authors and publications covering 24 topic areas such as cloud computing, autonomous vehicles, and cryptocurrency, with additional topics to come. While this information will interest reporters and editors, it will be especially useful to communications professionals who need a way to identify the reporters covering a particular technology news category, or founders and other startup employees who have the same need. A: Not presently, but we're considering such an option for 2019. To help is gauge demand, please let us know here.